Say what you will about the revealing of the US government’s program for phone surveillance as well as data collection from American tech companies known as “PRISM”. 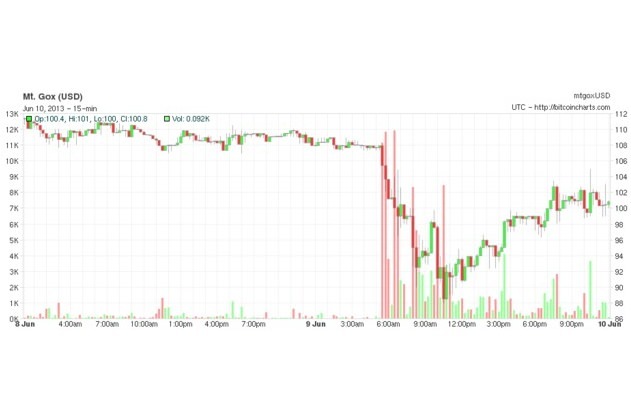 Since the story broke, it has clearly had an effect on the price of bitcoins. Don’t believe it? Take a look at this timeline of events from last week posted by the EFF when compared to a chart of the price of bitcoins on the Mt. Gox market. The sell-off has continued. On Sunday, a time when the market for bitcoins is slow-moving historically, the price dropped during heavy volume trading. The link between bitcoin price and public opinion has been well discussed. The rash of sell-offs in the past week indicates that some might be concerned about the role of bitcoin, considering how much the United States government knows about what occurs on the internet. While they cannot stop bitcoin, they can monitor it – which after the past weeks’ revelations, they most certainly are doing. That may be in contrast to what many bitcoin experts believe makes decentralized currencies important to people. As early investor Roger Ver recently said at a LeWeb 2013 panel on Bitcoin, people who believe that some currencies should be out of government hands should in fact be buying bitcoins as a result of the past week’s news. “One of the things governments around the world do currently is they finance their wars and the things that they do through inflation. The just print money for whatever it is that they want to spend it on. If the world were using bitcoin that would no longer be a possibility. If you’re opposed to governments inflating money to pay for wars around the world, bitcoin should be something you’re interested in.” said Ver. One could question whether or not people think that given that programs like PRISM are now out in the open. If they did, then wouldn’t the price of bitcoins be going up? If people around the world were concerned about U.S. government control, wouldn’t the price be spiking similar to the effect that Cyprus’s banking crisis at the end of March did? No matter which way you view the price drop, bitcoin is a something that is heavily affected by sentiment. The fact that it is decentralized does not make it immune to the government’s actions. Decentralization doesn’t mean it is disconnected from all of the other complex systems that make up the economic system. Governments are huge influencers in the economy, and will continue to be into the future. As CoinDesk’s Shirley Siluk recently pointed out, sentiment – the collective attitudes that people have about bitcoin – continues to be one the most important aspects that dictates its price. Sites like the Bitcoin Scope, which attempts to measure what people think about bitcoin in real time using news and social media analysis, will play a role in helping understand its value. Expect to see more tools that try to analyze and understand the reactions of bitcoin’s price to things like government control. Bitcoin cannot be defined as an equity instrument like a stock and it is certainly not a fiat currency. It’s something that has not quite been seen before, freely traded on a market. Watching all of its price movements can be disheartening and fascinating at the same time. It has the potential to change the way that we think about money. That will involve a discussion that global citizens of the world need to have given our reliance on fiat currency. Indications are that that perhaps bitcoin is not a way to avoid intrusion by governments. With such complex monitoring in place by the U.S. government, they’ve long known about bitcoin and likely have a sense about how it fits into the economy. Despite its cryptographic elements and decentralized nature, bitcoin is becoming an integrated part of the economy simply by virtue of its value. Will people continue to use it despite government surveillance? How do you feel about bitcoin in regards to privacy? Is bitcoin an answer to government control?